Share how your organisation delivered social value with us, and we’ll upload your story to our News for everyone to read! 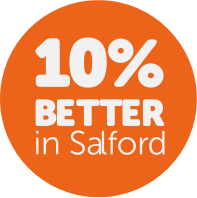 Your story inspires others to take part and spread the message of how we make Salford 10% Better. Please upload any photos that we can use as part of your story! Get inspired and read other Shared Stories!